Plus: An exploration of dignity, nobility and sports mascots; and you’re invited to take Chivalry Today’s new listener challenge, Lines Of Chivalry. 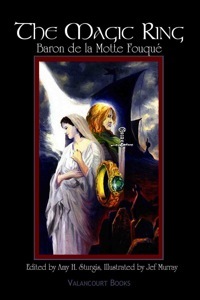 The Magic Ring Deluxe Illustrated Edition by Baron de la Motte Fouqué, edited by Prof. Amy Sturgis and illustrated by fantasy artist Jef Murray. Take the Lines of Chivalry listener challenge. Welcome to the fifth season of the Chivalry Today Podcast. What exactly is “chivalry today”? In this segment, host Scott Farrell takes a few minutes to examine the concept for new listeners of the show, then introduces the season’s listener challenge, Lines Of Chivalry. You’re invited to share your favorite line – from a movie, play, poem or song – that represents (in your mind, at least) the essence of what chivalry is all about. Each episode a select few lines will be read on the podcast, and every month one entry will get a great prize from our prize locker – on Episode 44, that will be a copy of the book The Economics Of Integrity, by Anna Bernasek. You can enter using the reader forum below, or by sending an email with the words “listener challenge” in the subject line. See our Listener Challenge page for full details and rules. The Magic Ring is a groundbreaking fantasy-Gothic-mythology-adventure novel first published in 1813, that established a new image of knights and chivalry that would prevail in art and literature throughout much of the 19th century. Although this book is largely unknown to English speaking readers (the last translation of the book was produced in 1925), a new illustrated edition of the story, edited by Prof. Amy Sturgis, is now available from Valancourt Books. Learn more about Prof. Strugis’ work in both fantasy literature and Native American studies at her website, AmySturgis.com. Tommy Tomahawk – An example of a mascot being treated like a court jester, rather than accorded an honest sense of dignity and respect. A new law challenging the use of Native American imagery in school logos and mascots brings to mind the aspects of dignity and nobility – one of the Knightly Virtues of the code of chivalry. 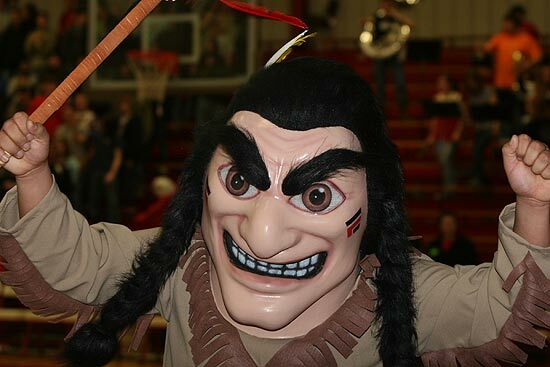 Are mascots like Braves, Chieftains or Comanches respectful tributes to native peoples? Or do these cartoonish images perpetuate racial stereotypes? And can this issue teach us something about the importance of nobility? Next Month on Episode 44: Scott travels to the Ozark Medieval Fortress to learn how a team of experimental historians is bringing a medieval castle to life in the hills of northern Arkansas – and what this project has to teach us about the life of a knight and the ideals of chivalry.